Ordinarily I don't write editorials and this blog is really about the miniatures hobby and my professional work within it. But, as you can see from this post date and the previous one, there has been a six-month gap between my posting here and the diversion I engaged in to fund my idealized projects. Over that time period the physical and emotional strain of working on the projects has caused my professional work to suffer, drained our savings, and damaged many of my personal and professional relationships. I am extremely grateful to all of our supports and enthusiasts who have contributed to these projects and participated in making them a reality. The main focus of this op-ed is mainly an observation of the community at large. The temperature of the community has seemed to have changed since the launch of our first project. I love being a freelance sculptor and ever since I was of grade-school age I dreamt of being some sort of a professional artist making a living from things I have crafted. It has taken me thirty-five years since then but now this is how I make my living, just like any other trained professional from electricians, to plumbers, to doctors, to mechanics. It is service oriented like the previous occupations listed but it is more like a lawyer who drafts a contract for a client or a carpenter who builds a fence on your property, there is a tangible item as a result, the sculpt. While these other professionals have a much larger service base, lots of people need or want their services, my area of expertise is very niche and luxury-based. The items I produce are for entertainment and the smaller market within that is tabletop gaming. There are only a handful of people in this industry who do what I do, and an even smaller amount who do it well. But at the same time, the audience for my work is also very small by comparison. Providing these services to clients is one thing. Making and selling produced goods is another. The things I am about to share are my opinions and observations about crowdfunding, specifically from the angle of the tabletop gaming category of Kickstarter and the community that surrounds it. I have launched four 'successful' Kickstarter projects in order to fund my own line of female character figures, a special release kit, a vehicle release resin garage kit, and a tabletop battle game with supporting line of miniatures called COUNTERBLAST. And while most of these previous Kickstarter projects funded, the final project did not and was relaunched in order to make a more attractive project to backers. I started developing the idea for the game many years ago. I had pitched the concept to another miniatures company in 2006 and even sold them several of the concept models for them to produce. Since nothing materialized with the game part, I stashed the concept until another opportunity presented itself. When Kickstarter became poplar as a opportunity to fund indy gaming projects, it seemed the ideal venue to present my game idea. So, over the course of time, we launched the other projects intending each to be stepping stones along the path to build the game project. We put together some initial pieces and ran demos at many different venues including GenCon. Reactions and feedback were always positive and we got lots of encouragement from the start that it was fresh take on the genre, even though it was retro in flavor. Our first version of the COUNTERBLAST funding project was assessed at a $60,000 goal. Now, while this may seem high it takes into account many things behind the scenes that have to happen to launch. Rational thinking told us that we had 1100 backers on the Babes project, so if half of them returned to back this that would be around 550. If the “sweet spot” of items offered was in the $100 range, as most other game projects, that would be $55K making it very close to that funding goal. We were out of pocket for concept art, advertising, and professional services fees but had to take into account the addition of all of the projected costs that manufacturing the items would need, like cover & interior art for the book, printing, molding, casting, and shipping. The professional services included rates for our writers to make the game material and sculpting fees for all of the models shown on the project. We launched the initial COUNTERBLAST project for thirty days where over the course of a week it met it’s apex and then stalled, failing to attract any additional backers over several days. We discussed the cause of this at length. We had a critical window for delivery so each day that the project sat there unable to attract any more backers, we lost valuable production time. Do we spend more money on banner ads? How can we get the word out to even more potential backers without it looking like spam? I was even accused of usurping free advertising on one Facebook group and subsequently I removed my posts there. So, after rebuilding the project from the graphics on up, I took it upon myself to cancel the first project in order to relaunch and reduce as little downtime as possible. Our existing backers seemed amiable for the most part, however I was completely taken with shock at some of the vitriol that was posted about canceling the first version of the project. Another Forum poster added this. That may be the case. But can you explain how the merit of the material has changed simply because we want to restructure the funding project to add value to it? Has the writing or rules changed somehow? Is the sculpting of less quality now? Have the art or designs changed? It evidently hasn’t because you feel willing to purchase it retail afterwards. I all likelihood it was not going to fund and looking at the Expected Projection tab on Kicktraq for a project does not predict what a project will do, only what the potential would be if every day was exactly the same as the actual completed days. To prove this, you can watch a project's Expected Projection drop every day the "Pledges per Day" and "Backers per Day" drops. This provides a completely skewed expectation in many backers’ estimations of a project because as the next graph shows, there is a distinct opening and closing rush to most every project. So, we relaunched the project with a $15K goal and most of the existing backers migrated over to the new one. This allowed us to fund the project quite early, within the first day, and then offer new items as additional funds were pledged. What was pretty clear after the first week of the 'new and improved' project was this was going to be all of the activity the project was going to get. It also confirmed that the first version would not have funded at all, anyway. This particular pattern in the above graph of the revised project does not seem to be unusual. Looking at similarly structured projects to ours and comparing their pledge trends to ours it seems similar, too. It takes into account the psychology of many backers in the community. Why there is now a trend towards abandoning most projects in the final third of the funding period is very confusing to me. And this is not a psychological study, merely an observation. This has happened on other projects that were similar in scope to ours, Pulp City: Extreme Edition and Empire of the Dead: REQUIEM. In a recent conversation with Dark Sword Miniatures owner Jim Ludwig, we discussed these trends at length. Is it that the projects run for such an extended period that there is not enough growth to offset the backers who will inevitably drop out? Would the answer be to run shorter projects? I can’t say. In running a shorter project you limit the exposure of the funding period and many who would want to back it may miss it, but then there is no sense of urgency to prompt backers to pledge early that the shorter project may offer. So, in essence we netted about half of what we really needed in order to make the project viable. This statement is not intended to imply we will not deliver the rewards. We will still produce all of the items and fulfill all of the backer rewards on time, or as close to it as possible, as we have done on our other projects. But what would have allowed a bigger margin to develop more new models and get more art for the book are just not there. Well - this is fun, right? You love your job so that's it's own reward, right? Please see paragraph two, above. I'm sure many other professionals love their jobs, too, but will their lovin' pay their bills? We had no gameplay video at the launch, as it’s to fund a GAME! Going forward, these are certainly things we will address. Our main focus now is fulfilling our backer's rewards while cultivating and growing our community of Bombardiers. The game has yet to be released to the wider market and the next few months will be extremely important to raise awareness and show how cool it is which will hopefully generate even more interest. 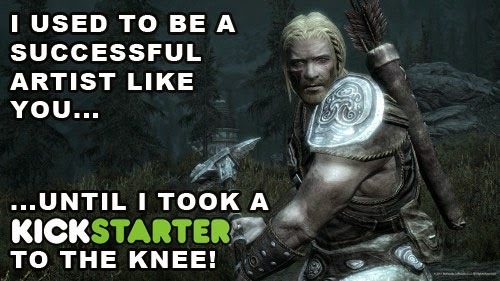 Will I return to Kickstarter to fund future projects? I don’t know. But in a conversation with writer and game blogger Tom Haswell (Second Class Elitist) from the League of Extraordinary Gamers, he mentioned something that we had already discussed here at the Bomb Factory. 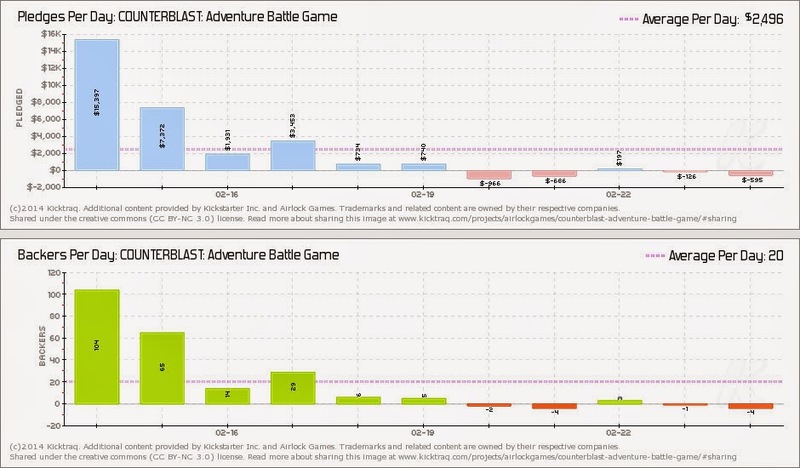 From a Kickstarter project with limited freebies and a non-40K clone to boot, 300+ people bought *our game* with the intention of playing *our game. * (300+ backers because some of the higher pledges are group or club pledges) That's not a bad start out of the gate. Given a small, invested player base a really tight product with great post-production values, and they'll play it with their friends. Who will then buy models to play with more friends.